Mindroling Monastery is one of the six major monasteries of the Nyingma school in Tibet. It was founded by Rigzin Terdak Lingpa in 1676. Tendrak Lingpa’s lineage is known as the Nyo lineage. Mindroling, in Tibetan means «Place of Perfect Emancipation». It is located in the Lhasa region of Tibet, approximately 43 kilometers east of the Lhasa airport, on the south side of the Tsangpo river. Mindroling was heavily damaged in 1718 by the Dzungar Mongols from East Turkistan.It was rebuilt during the reign of the Seventh Dalai Lama, Kelzang-Gyatso (1708-1757). Dungsay Rinchen-namgyel and Jetsunma Mingyur Paldron, the son and daughter of Terdak Lingpa, supervised its reconstruction. For nearly 300 years its monastic university trained Nyingma scholars and yogis from all over Tibet. At Mindroling, special emphasis was placed on the learning of Buddhist scriptures, astronomy, Tibetan lunar calendar, calligraphy, rhetoric, and Tibetan medicine. Monks traditionally studied thirteen major sutra and tantra texts of the Nyingma, and learned the practices stemming from various terma, especially from the lineage of Terdak Lingpa. The monastery had at one time, over one hundred satellites and its throne holder was one of the most revered in Tibet. At the time of the 1959 revolt against Chinese Communist rule in Central Tibet, there were approximately 300 monks at Mindroling. 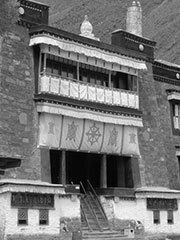 In the years after 1959, the monastery again suffered damage to its buildings, but it was not as severe as at other monasteries such as Ganden. At present, the monastery is still being reconstructed in Tibet. In 1965, His Eminence Khochhen Rinpoche, and small group of monks began the process of re-establishing Mindroling monastery located near the hill town of Dehra Dun in Uttaranchal state, India. It now contains Ngagyur Nyingma College, one of the largest Buddhist institutes in India.